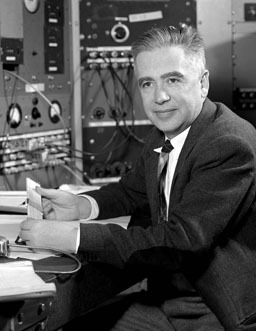 American chemist and nuclear laureate Emilio Segrè was born and raised in Italy, and was Enrico Fermi's first graduate student at the University of Rome. In 1937 with mineralogist Carlo Perrier (1886-1948) he discovered technetium, the first man-made element. Technetium, named from a Greek word meaning artificial, is formed when molybdenum is irradiated with deuterium nuclei. It is a radioactive metal that has been used as a tracer and anti-corrosive in steel. In 1938, however, Segrè was fired from his position as Administrator of the Physics Laboratory at the University of Palermo, not for any misconduct but because the fascist government of Italy under Benito Mussolini had deemed that Jewish scientists should not be allowed to hold such posts. He then came to America, where he worked under Ernest Lawrence at the University of California's Berkeley Radiation Lab. In 1940, he was part of a team of scientists that proved the existence of astatine by bombarding bismuth-209 with alpha particles. During World War II his parents were taken prisoner by Nazi forces; his mother was killed but his father escaped. In America, meanwhile, Segrè was a group leader in the Manhattan Project at Los Alamos, America's secret program to build an atomic bomb, and described the project as "a dream scientific community behind barbed wire". In 1944 he made the crucial discovery that plutonium made in a nuclear reactor has higher levels of the isotope plutonium-240 than plutonium produced in a cyclotron. In the same year, he became an American citizen. He is best known for his 21 September 1955 discovery with Owen Chamberlain of the antiproton, the unstable negatively charged proton that exists as the antiparticle of a proton. This helped to support Paul Dirac's theory or antimatter, and earned the Chamberlain and Segrè the Nobel Prize for Physics four years later. Frequently but erroneously listed as 1 February 1905, due to a bureaucratic delay in filing his birth certificate.